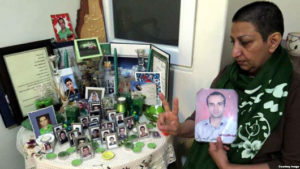 Shahnaz Akmali’s son, Mostafa Karim Beigi, was killed in the crackdown that followed mass street protests over the disputed June 2009 presidential vote. A court in Iran has sentenced the mother of a protester killed in a government crackdown in 2009 to a year in prison after convicting her on charges that include spreading “propaganda against the establishment,” people close to her say. Shahnaz Akmali has also been barred from posting on social media and banned from leaving Iran, people who are familiar with the ruling told RFE/RL’s Radio Farda on October 26. They spoke on condition of anonymity for fear of reprisals. Akmali’s son, Mostafa Karim Beigi, was killed in the crackdown that followed mass street protests over the disputed June 2009 presidential vote. The rights group said in a report issued in August that Iran’s judicial and security bodies have waged a vicious crackdown against human rights defenders, demonizing and imprisoning activists who dare to stand up for people’s rights.